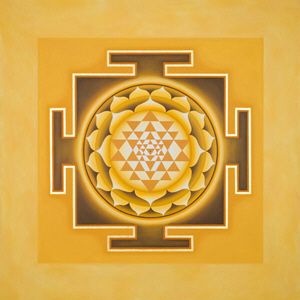 Sri Yantra. The circuits from the outer plane to the center, corresponds to the stages of a spiritual journey. The term Yoga is a word from the ancient Sanskrit language, and has many meanings, dating 4,000 B.C. Sanskrit, which belongs to the Indo-European language group, is the language in which most traditional Yoga texts are written. In regards to the yogic tradition, two meanings are particularly relevant: union and discipline. Yoga is a spiritual unitive discipline tradition within the great cultures of Hinduism, Buddhism, and Jainism native to India. Today Westerners are often practicing Yoga techniques (especially postures) detached from their traditional sacred background. Although Yoga postures are very effective for maintaining and restoring one’s physical health, the true power of Yoga lies in its capacity to lasting happiness and inner freedom.